Michelle Krebs, an executive analyst for Autotrader, said this earlier this month. She was speaking about last month’s auto sales… And she wasn’t mincing words. Auto sales fell off a cliff in September. Ford’s total sales dropped by 11%. Toyota reported a 10% decline in sales for the month, while Honda and Nissan reported declines of 7% and 12%, respectively. These are huge declines… But there’s a reason that auto sales have hit the skids. This is because the cost of financing a new car is surging. According to online auto resource company Edmunds, the average annual interest rate on a new vehicle reached 5.8% last month. That’s up from 4.8% in 2017. The number of buyers getting 0% interest rate loans has also fallen from 10.1% a year ago to 5.6% today. Now, interest rates can rise for many reasons. But in this case, the Federal Reserve played a huge role. 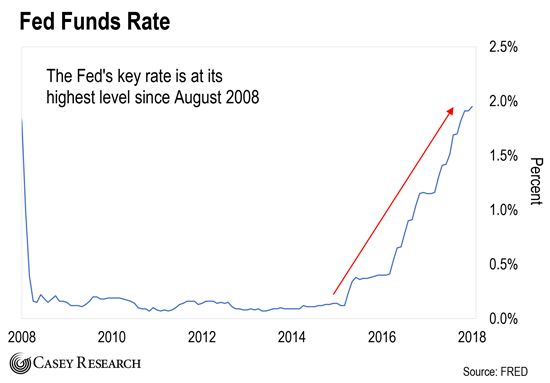 Last month, the Fed lifted its key interest rate for the third time this year… and the sixth time since the start of 2017. This benchmark is now sitting at its highest level since August 2008. The Fed’s key rate sets the tone for interest rates across the economy. So, the Fed effectively made it more expensive to finance a new car by raising rates. Just look at the average rate on a 30-year fixed mortgage. It’s above 5%. That’s almost a full percentage point higher than a year ago. That might not sound like much. But this move has a huge impact on home affordability. Higher mortgage rates have increased monthly costs for homebuyers by 15%, according to real estate company Zillow. That equates to about $1,200 per year. Zillow also recently reported that rising rates have cost the typical homebuyer nearly $30,000 in purchasing power. This is bad news for anyone in the market to buy a home. It’s also hurting the housing market at large. Sales came in 5.5% lower than August, and 13.2% lower than a year ago. New home sales are now sitting at the lowest level since December 2016. And that has taken a toll on housing stocks. Just look at the chart above. 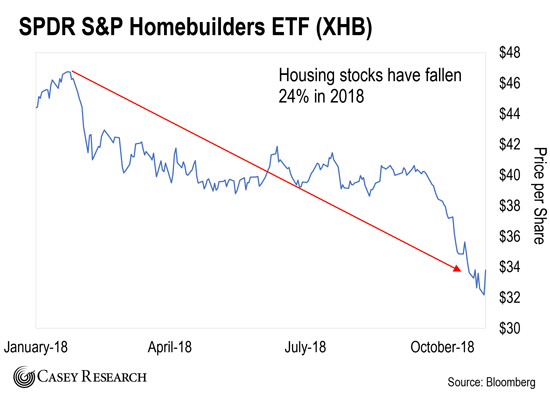 It shows the performance of the SPDR S&P Homebuilders ETF (XHB) this year. This fund tracks the share performance of companies with exposure to homebuilding activity. You can see that XHB is down 24% since the start of the year. The S&P 500, for comparison, is flat on the year after its recent pullback… But the broad market could be headed much lower from here. I say this because auto and housing aren’t the only industries that depend on cheap credit. Experts have predicted Bitcoin would replace the dollar, but we’re far from that point. Just look at corporate debt levels. They’ve exploded in recent years. 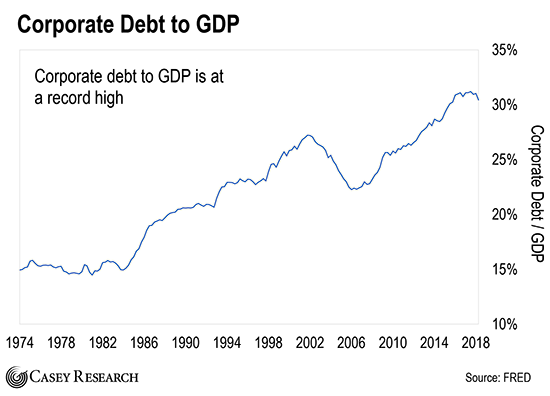 You can see that the amount of outstanding corporate debt, as a percentage of gross domestic product (GDP) – annual economic output – is at record highs. This explosion in corporate debt occurred because the Fed made it incredibly cheap to borrow money. 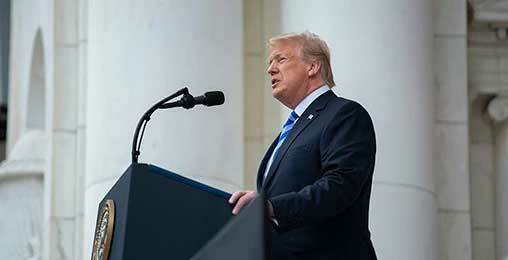 That could make it very difficult for highly leveraged U.S. companies to pay off their debts. In other words, we could be on the verge of a huge spike in corporate defaults. According to financial services company Standard & Poor’s, about $4.4 trillion of corporate debt is scheduled to mature through 2022. That includes about $1.3 trillion of junk bonds that have been issued to risky companies. In short, the auto and housing industries were some of the first industries to feel the brunt of higher rates. But they likely won’t be the last. Keep this in mind if you still own a lot of U.S. stocks. If you have any money in the stock market right now, take a good look at your portfolio. Avoid companies with a lot of debt. If the economy continues to weaken, heavily indebted companies will struggle to pay their lenders. You don’t want to own a company that falls behind on its loans. We encourage you to hold more cash than usual. Setting aside cash will allow you to buy world-class businesses for cheap after the next big sell-off. Finally, we recommend owning physical gold. As we often point out, gold is real money. It has preserved wealth for centuries because it’s a unique asset. It’s durable, easily divisible, and easy to transport. Dear Casey Research, I learn so much from Doug, and all of his associates. I simply wish to express my gratitude. I have a limited education about history, economics, and politics, and I am so glad I became a subscriber. Doug, may you never leave us. Thank you for sharing your knowledge.